Vintage books often contain many tips and hints for easy living. 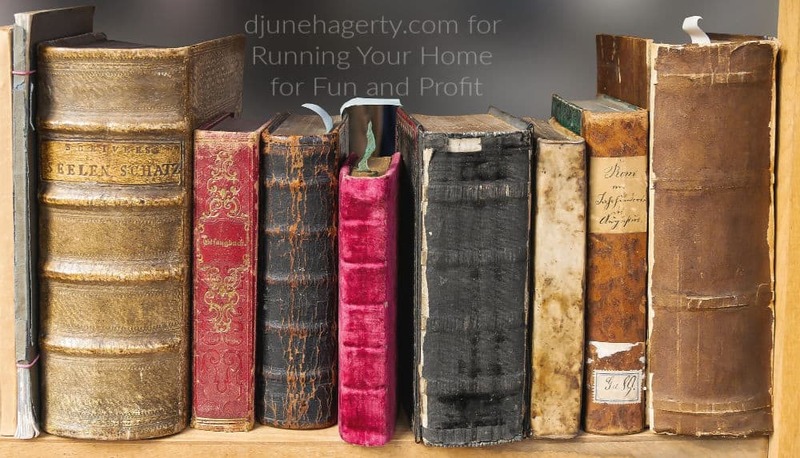 Here are some quick tips from me and my vintage library to help you save time and money. Want to know how to stock up easily? First clean out a closet, if possible, or set up a large set of shelves somewhere. This will be Supply Central. Now each time you need to go to the grocery store, check your list (which I am sure you write out each time, yes?) for any items which, if you were completely out of them, you would have to go the the store NOW for them. Example: toilet paper. Most households would not like to wait two or three days for a resupply of that item! Mark the items on your list so that you remember to buy an extra for Supply Central. Each household has its own “have to have now” items. Mark them as they come up on your list. Purchase an extra and put it on the Supply Central shelf. After you believe you have run out of the “Emergency! Must run to store!” items to stock, move on to those items that make people really unhappy if you run out between grocery store visits. Again, these are different for each household. These are then marked as they make the list and again you buy an extra for the Supply Central shelf. Continue adding the next most important class of needs until you have all your grocery needs covered. The second part of this matters as much as the original purchasing does. When you run out of an item which you have on your Supply Central shelf, you may get the item off the shelf BUT you must put it on your grocery list immediately. Again, mark it for the purchase of two: one for Supply Central and one to be used next. This helps keep you from ever totally running out. Also, the added expense is minor because you’re adding items slowly. Another gem from the same book: to prevent small objects and toys from disappearing down furnace floor registers, line the underside of the register with a piece of window screen.